My mother passed away this summer rather suddenly, but her many lessons remain with our family. While I learned countless things from my mom, one of the most important things she taught me was the significance of an apology. I have been thinking about this motherly instruction in the wake of the various reports of sexual misconduct by major figures in our society. Whether these accusations involve politicians, movie titans or journalists, each of them has produced some form of an apology. Yet, despite these apologies, it seems that few people are convinced of the accused person’s contrition or that justice is being served through such apologies. Why do these apologies from prominent men in our culture come across as empty gestures? The answer can be found in the fact that we see no real sense of change on the horizon. For an apology to truly resonate, it cannot be a carefully crafted public relations message. 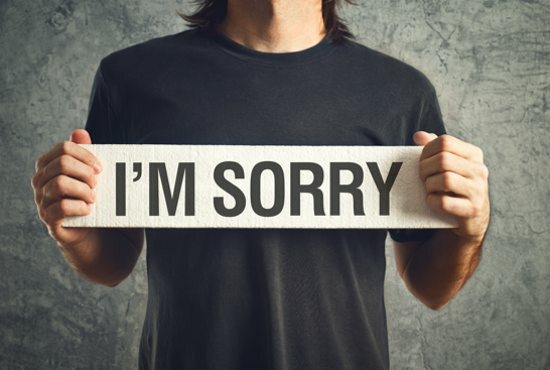 Instead, an authentic and complete apology is one that signifies a person will change his or her life. In essence, a real apology is a statement of conversion that begins with accepting responsibility for one’s own life. Excuses, scapegoats and conditions are not included in sincere apologies. A good apology begins to redress the errant behavior by acknowledging the truth that one has sinned. Sin is an offense against God and his creation, so the best way for us to offer a valuable apology is to consider the damage our behavior has caused in our relationship with God and our fellow man. The other person’s faults are not our concern when we offer an apology; the focus must remain entirely on our own responsibility and the impact our behavior has had on another. Naturally, as Catholics, any sincere apology to another person will also be accompanied by a sacramental confession to God. In fact, the sacrament of penance is a perfect place to begin our efforts at reconciliation with other people, for a good confession not only bestows God’s forgiveness, but it also grants us the grace of conversion to overcome future sin. Part of our confession to God involves a firm purpose of amendment. In seeking to turn away from sin, we must also have a specific plan of how to change our life. The amendment that we seek to produce in our life cannot be a vague sentiment to try again or be better, but it must have concrete goals on how we will turn our life over once again to the good things of God. Apologies that take full responsibility for one’s own action, acknowledge the damage caused by the offense and clearly articulate a means of becoming virtuous are what allow the process of reconciliation to begin. In apologizing for our sins, our purpose is to hold ourselves to a higher standard so that our lives may present no obstacles to Christ in this world. Father Meyers is pastor of St. Francis Xavier in Buffalo.